Cosy, warm, glamorous all in one dress. 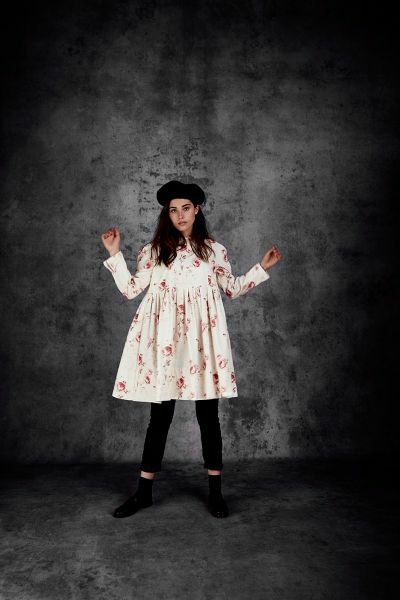 Made from Cabbages & Roses British printed cotton velvet, Ari is a multi-purpose dress which will take you from day to night on cold and frosty days. She has a loose fitting bodice with a stand neckline, is attached to a generous pleated skirt reaching knee length. 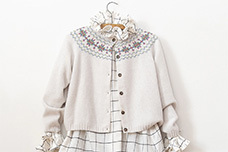 Beautifully warm with long sleeves and a buttoned cuff. The Rosie velvet Ari dress is a comfortably fitting velvet dress. The velvet has a slight stretch to it, for ease of wear and comfort. The shoulders have a slight puff and the dress bodice is generous in fit. The dress comes to just around the top of the knee so you can wear it either alone or with trousers peeking out from underneath. 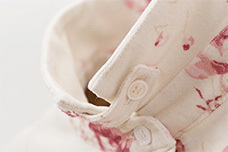 Ari has buttoned cuffs and a small stand collar. 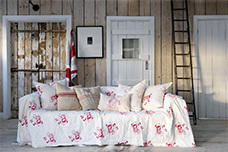 Rosie is a new Cabbages & Roses print which is printed by our lovely printers based in Sussex. Caring for Ari. Ari is made from 98% cotton velvet with a tiny bit of spandex (this does not show at the front of the fabric but is used to make the fabric more durable) the bodice is lined with 100% soft cotton lining. This means you can very carefully wash Ari, but make sure the wash is cold in case the lining shrinks. We recommend using Ecover delicate laundry liquid. You can also dry clean Ari with an ecologically friendly dry cleaner. Do not bleach or tumble dry.